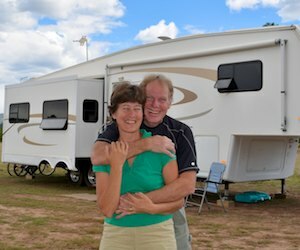 April, 2015 – Florida was heating up fast and Sarasota had become a veritable sauna, so it was time to pack up the RV and head north to cooler climes. Before long we were in Thomasville, Georgia. 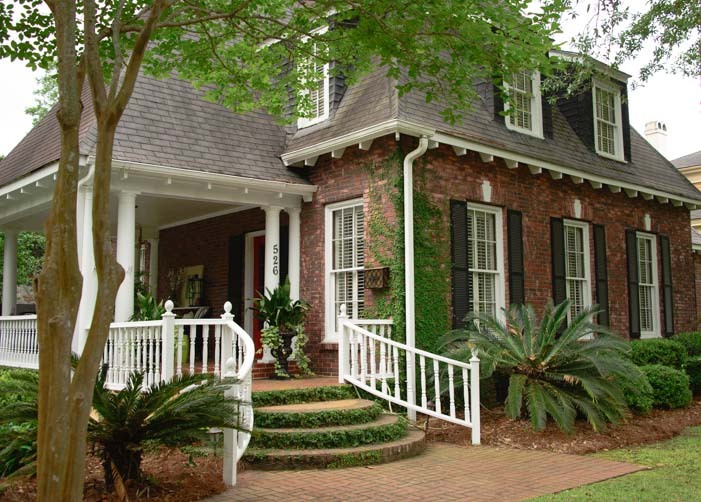 What a delightful change it was to go from the vacation spirit of beachfront Florida to the stately antebellum elegance of mansions with columns set back from beautiful tree-lined streets. We hopped out of the truck for a walk — and found this! 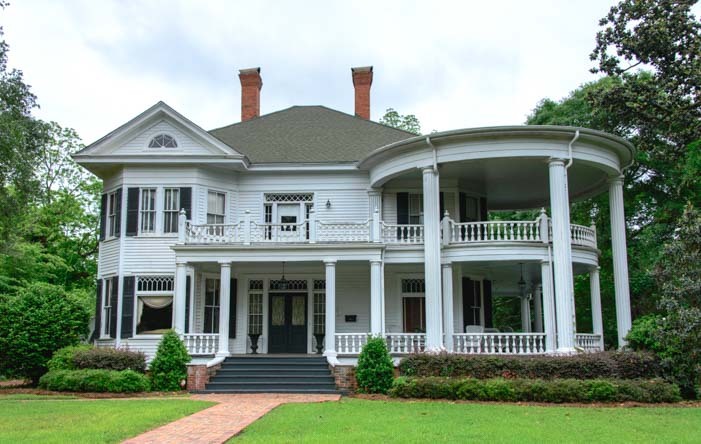 Check out that double rotunda porch!! We parked our truck near a cool looking church and just started walking. We had no idea we’d planted ourselves on one of the most elegant historic streets in town at first, but the rows of gorgeous old homes captivated us. We were on Hansell Street in the Tockwotton district, and as we walked down these shady, wide streets, we were instantly transported back in time to an era long ago. I could just imagine myself sweeping out onto one of the broad porches in long, flouncy gown, entertaining my gentleman callers!! 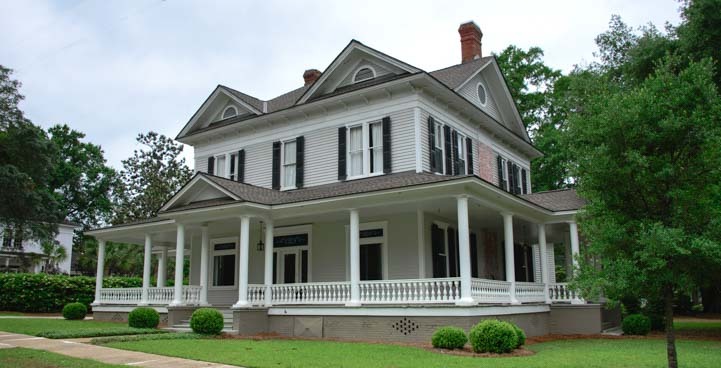 These graceful houses here were built in the early 1800’s, prior to the Civil War (which is what “antebellum” means). Wealthy northerners looking for a respite from winter found Thomasville was the perfect place to escape the snow and cold back home. If these were their winter getaway cottages, then what did their “real” homes up north look like?! A place to sip mint juleps in a graceful gown. These homes take a lot of work to maintain, and several landscaping crews were busy in the yards on this street. We saw a young fellow with a hedge trimmer in his hand, and I ran over to ask him for directions to the visitors center. I was really taken aback when he addressed me as “ma’am.” I turned around to see if he was talking to someone behind me! These houses were winter “getaway” homes for northerners! But that was the norm throughout our stay in southern Georgia. We had suddenly risen to the status of Ma’am and Sir, despite running around town in t-shirts and shorts, and the people we met couldn’t have been more friendly. “Come on in, Ma’am” !!! 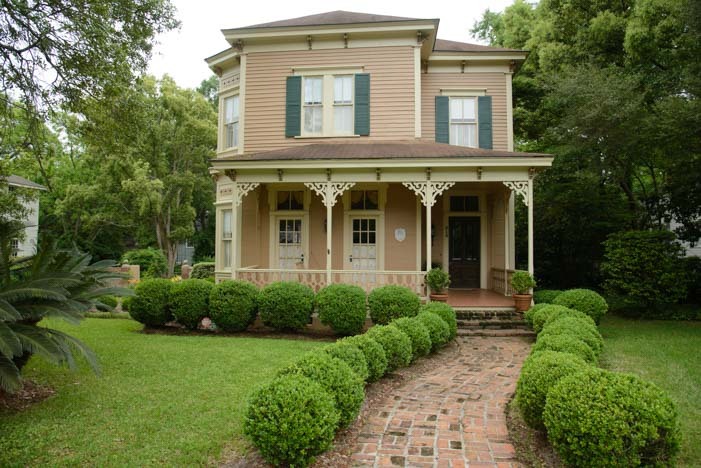 Thomasville’s historic districts are delightful, and we found more lovely homes on Dawson Street. 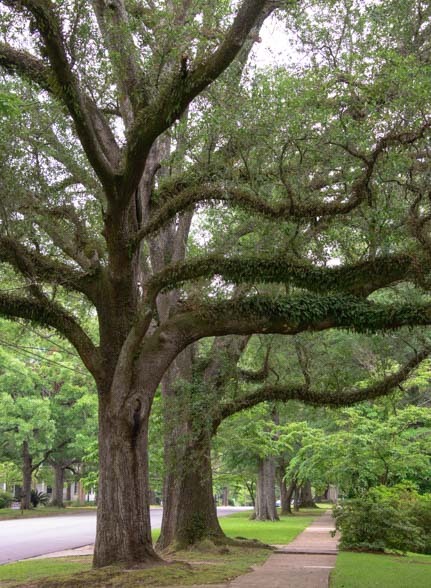 Massive live oak trees spread their branches wide across the streets, and some of them are draped with parasitic frilly plants. 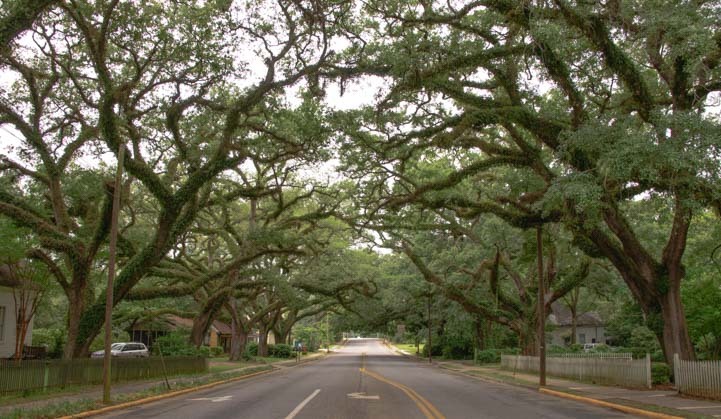 Enormous trees arch over the historic streets. We were just over the border from Florida, and in many ways the climate and vegetation felt like north Florida. We just loved the huge trees. 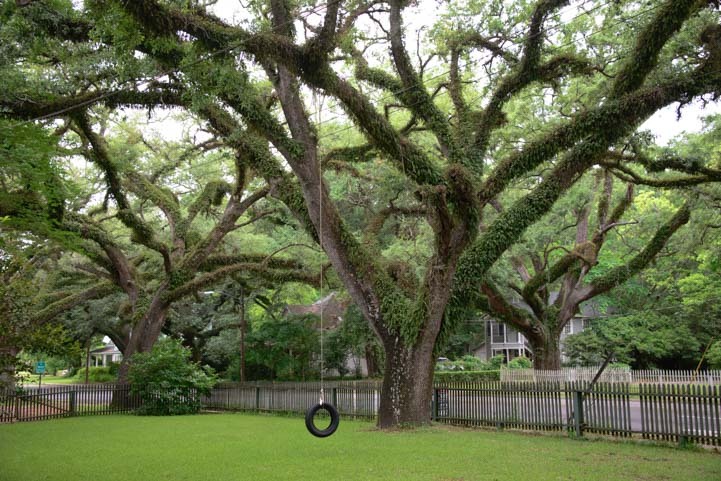 One family had hung an old tire swing from one of the tree branches hanging over their yard. I so wanted to try it out! The young landscaper with the hedge trimmer had told us to head over to check out The Big Oak. When we got there, we found it took up an entire house lot site. It was just enormous — and very ancient. 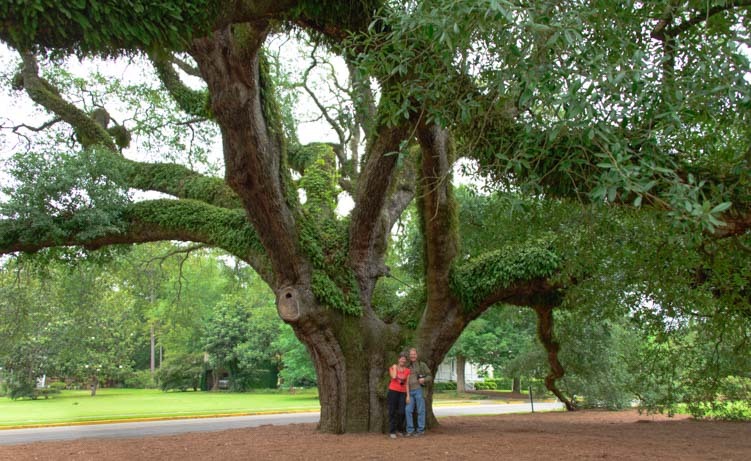 It’s limbs span over 165 feet and it’s over 68 feet tall. More impressive, it is around 335 years old. It was a sapling back in the 1680’s! The Big Oak was a sapling when America was first being colonized. 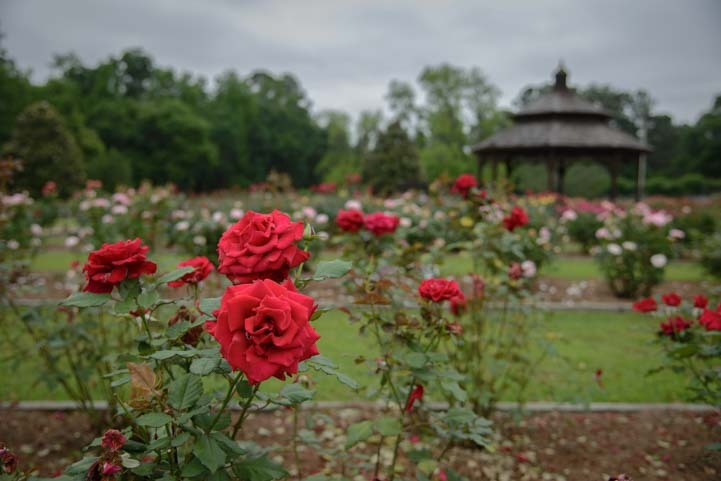 Thomasville, Georgia, is known for its expansive rose garden. 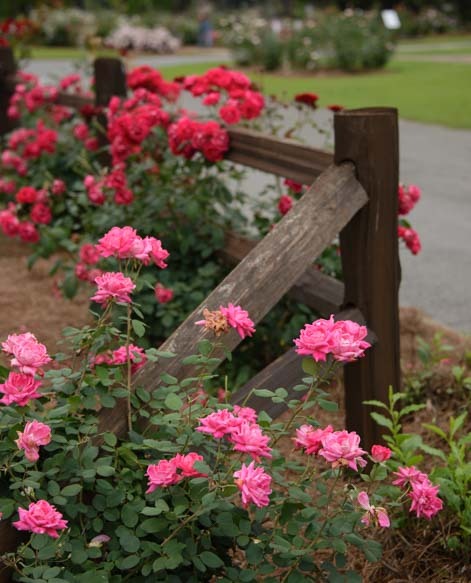 We arrived just two days after the end of their annual springtime Rose Festival and the roses were at their peak. 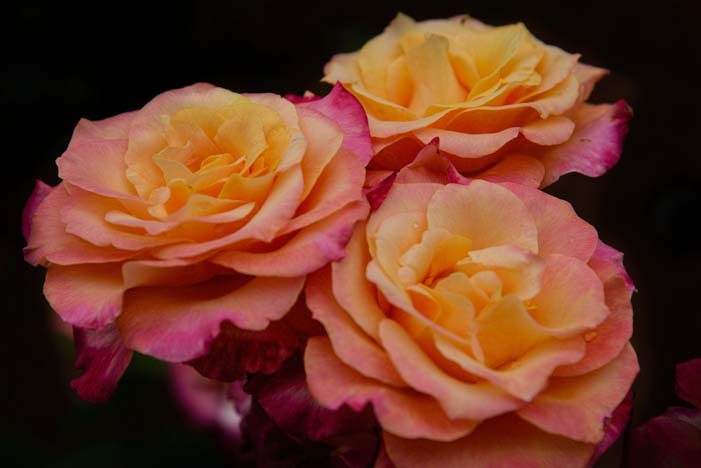 This garden has many different varieties of roses, and we really enjoyed the lovely shapes and heavenly scents of each variety. 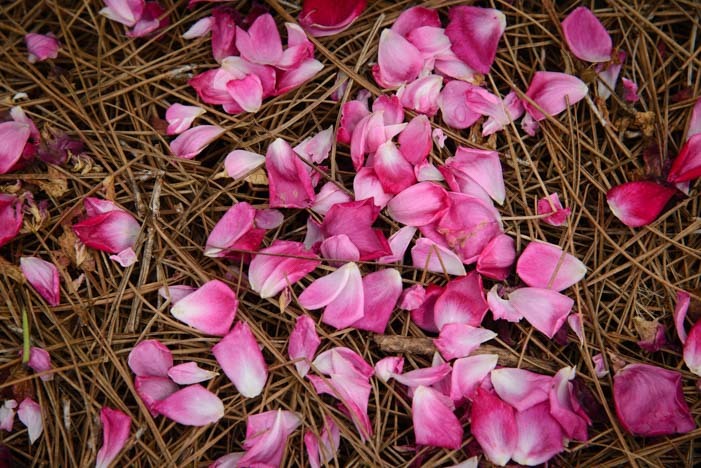 Even the petals that fell on the ground around the rose bushes were lovely. Rose petals beneath a rose bush that had already come and gone. 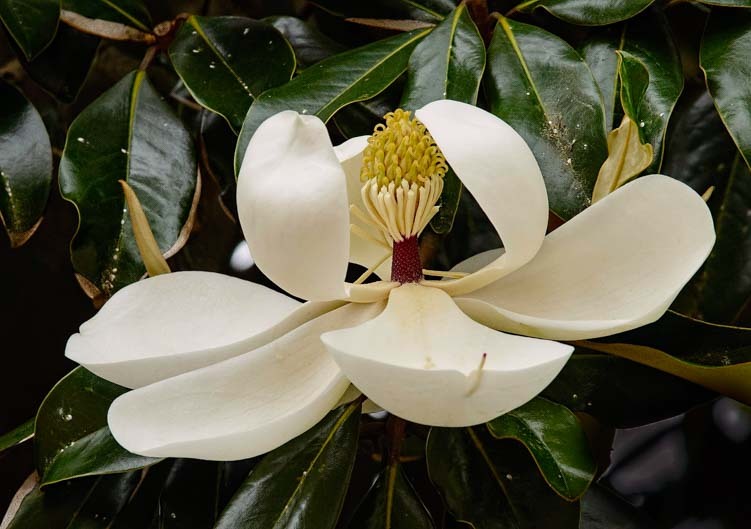 Spring was springing all around us, and huge magnolia trees were in full blossom too. 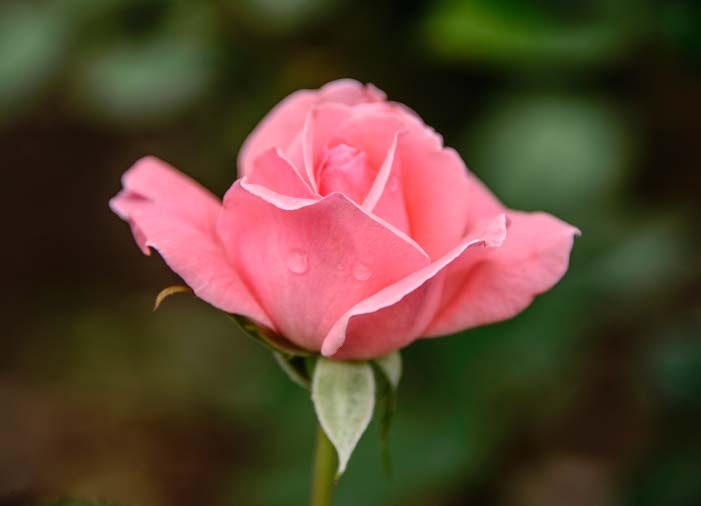 What a handsome flower they have!! 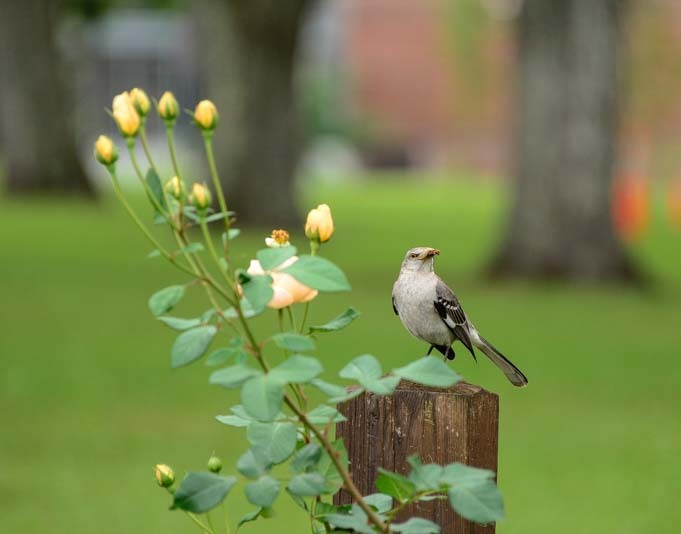 Not far from the Rose Garden is a pretty park with a big pond and a peaceful air called Cherokee Lake Park. 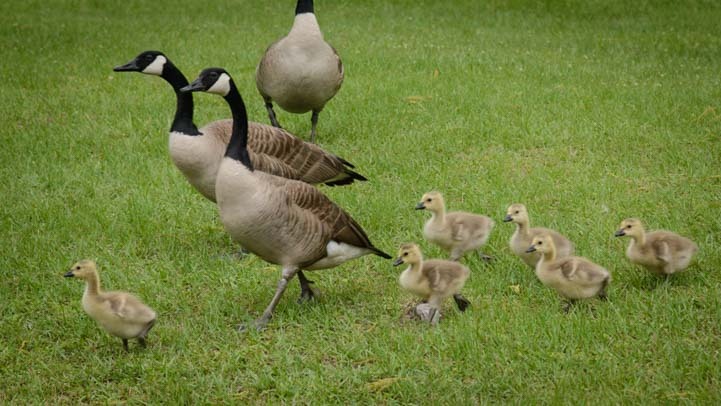 We wandered along the water’s edge and watched some young goose families make their way across the vast lawns. A little goose family trucks across the lawns at Cherokee Lake Park in town. These guys were just too cute. They reminded us of the little sandhill crane chicks we had seen back in Sarasota Florida a month earlier. (And we’ve heard from our friend there, by the way, that they have been spotted again and are now half the size of their parents and are doing very well!). 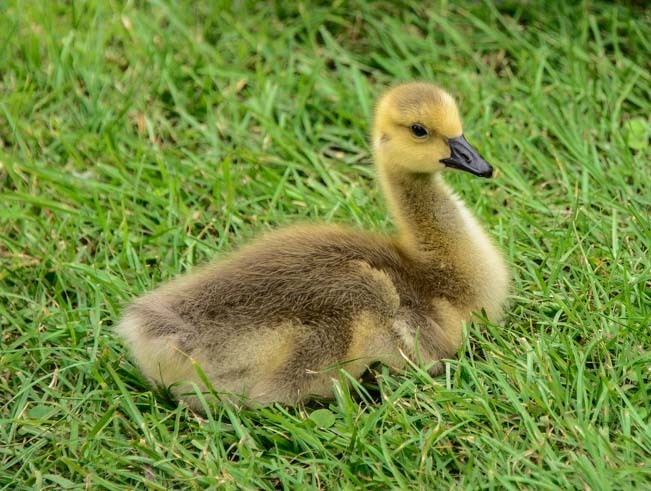 A little gosling rests in the grass. 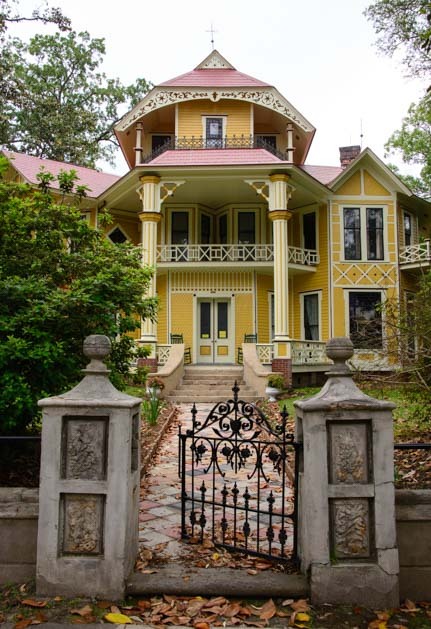 Our stay in Thomasville was just a few days, but it was a great first stop in Georgia, and is one of the towns we enjoyed most on our all-too-brief tour of this pretty state. Thomasville was a wonderful introduction to Georgia for us. This entry was posted in Georgia and tagged Georgia, New, Travel, USA, WP Travel by Roads Less Traveled. Bookmark the permalink. Lucky you to grow up in such a pretty town, Diann. We just loved our visit there! !